This Companion serves as a guide for readers wanting to explore the thought and legacy of the great German theologian Dietrich Bonhoeffer (1906-45). The book shows why Bonhoeffer remains such an attractive figure to so many people of diverse backgrounds. Its chapters, written by authors from differing national, theological and church contexts, provide a helpful introduction to, and commentary on, Bonhoeffer's life, work and writing and so guide the reader along the complex paths of his thought. Experts set out comprehensively Bonhoeffer's political, social and cultural contexts, and offer biographical information which is indispensable for the understanding of his theology. Major themes arising from the theology, and different interpretations to it, lead the reader into a dialogue with this most influential of thinkers who remains both fascinating and challenging. There is a chronology, a glossary and an index. - Publisher A guide to the great German theologian Dietrich Bonhoeffer (1906?45). 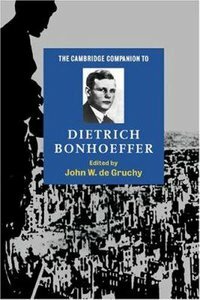 About "The Cambridge Companion to Dietrich Bonhoeffer"
A guide to the great German theologian Dietrich Bonhoeffer (1906?45). 13. Prayer And Action For Justice: Bonhoeffer's Spirituality Geffrey B.